As ransomware shows early signs of decline, new forms of attack emerge to take its place. Stealthy techniques allow attackers to fly under the radar, placing enterprises at increasing risk. • Formjacking was the breakthrough threat of 2018, as cryptojacking and ransomware show signs of decline. However enterprises continue to face the problem of targeted ransomware. •. Living off the land and supply chain attacks are now a staple of the new threat landscape. • Cloud users facing challenges on multiple fronts through data leaks from cloud storage and low-level chip vulnerabilities. • Targeted attack groups show increasing interest in operational targets; greater number of groups adopting destructive malware. Complexity, technological change, regulation and the growing power and resources are increasing the pressure on security professionals. Over half feel paralysed by the overwhelming volume of threat alerts, with a quarter saying the sheer volume of alerts makes it more difficult to keep their business safe. Over a quarter say they are vulnerable to avoidable incidents. A brand new survey of over 3,000 cyber security professionals reveals that intense pressure is affecting decision making and increasing the risk of critical mistakes. Put simply, today’s constant state of high alert is unsustainable. Join leading psychologist Dr Chris Brauer from Goldsmith’s College, University of London, and Symantec EMEA CTO Darren Thompson, as they present the survey findings, and analyse what they mean for organisations like yours. -Why the Symantec Integrated Cyber Defense Platform can help put your plan into action. 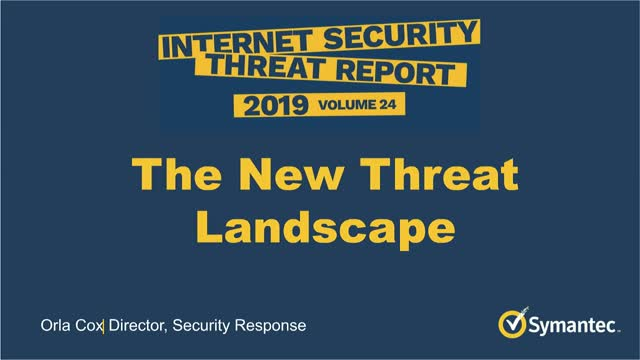 Increased cloud adoption, mobile device use, and the dramatic growth in the number of remote and home workers is putting pressure on existing security infrastructures. - How can I consistently enforce policies governing the use of the web and cloud? - How can I effectively protect my users from web-based threats? - How can I secure my sensitive data and comply with legal regulations? Enterprises are turning to a comprehensive cloud-delivered security solution to tackle these challenges. Join us to learn how Symantec’s Cloud Security Services can be leveraged to protect users, data and devices, addressing the challenges of the cloud generation. •Nel 2018 il declino di cryptojacking e ransomware ha coinciso con l'esordio del Formjacking. Le imprese, tuttavia, continuano a scontrarsi con il problema dei ransomware mirati. •Oggi gli attacchi "living off the land" e alle supply chain sono divenuti un cardine del nuovo panorama delle minacce. •Gli utenti del cloud si trovano a combattere su più fronti, dal rischio di perdere i dati dagli storage sul cloud alle vulnerabilità dei chip di basso livello. •I gruppi di attacchi mirati mostrano un crescente interesse per gli obiettivi operativi, e sempre più gruppi adottano malware distruttivi. •Le formjacking (ou piratage de formulaires) a fait une percée en 2018, tandis que le cryptojacking et le ransomware amorcent un déclin. Les entreprises continuent néanmoins de se heurter au problème du ransomware ciblé. •Pour les utilisateurs du cloud, les risques se multiplient sur plusieurs fronts, avec notamment les fuites de données à partir du stockage cloud et les vulnérabilités processeur de bas niveau. •Les groupes menant des attaques ciblées montrent un intérêt croissant pour les cibles opérationnelles ; de plus en plus de ces groupes adoptent des malwares destructeurs. We chat about a slew of stolen online account data found for sale on the dark web, malware targeting Macs, and container vulnerabilities. Also this week, we look at a Wi-Fi connected USB cable that can allow for remote attacks on targeted computers. We discuss a bad week for cryptocurrencies, the new Google Chrome extension that will let you know if your password has been breached, why parents should be wary of kids’ smartwatches, and why we all should be wary of phone apps that promise to make you look beautiful. Plus, we chat about the experience of one Illinois family who felt the heat after their suite of Nest devices was hacked. •La amenaza de mayor impacto en 2018 fue Formjacking, mientras que el hackeo de criptomonedas y el ransomware mostraron ciertos signos de debilidad. Sin embargo, las empresas tienen que seguir enfrentándose al problema del ransomware dirigido. •Los ataques del mundo salvaje y contra las cadenas de suministro son el pan de cada día del nuevo panorama de las amenazas. •Los usuarios de la nube se enfrentan a diversos desafíos en múltiples frentes como consecuencia de las fugas de datos a partir de los almacenamientos en la nube y las vulnerabilidades de bajo nivel tipo chip. •Los grupos que desarrollan ataques dirigidos muestran un interés cada vez mayor en los objetivos operacionales, constatándose un mayor número de grupos que emplean malware destructivo. Are you storing sensitive data and running business-critical operations in AWS? The news is full of stories about data exposure and loss involving misconfigurations, misuse, or compromised accounts in AWS. Analysts are urgently advising organizations to get automated controls and centralized management in place to secure their IaaS operations. As a result, IT organizations are increasingly looking for solutions that provide visibility, behavior monitoring, access controls, data security, and threat protection for AWS. Join us to learn how to get security in place fast and the Top 5 things to consider when securing AWS. Cloud computing enables companies to be more agile and squeeze the inefficiencies out of the development cycle, such as procuring compute resources on demand rather than waiting for IT. But as companies move fast to deliver new products, security must move faster to keep up with new regulations and threats – or risk slowing down the business. Cloud configuration errors can lead to gaping holes in cloud infrastructure deployments and present low hanging fruit for hackers. Security and DevOps teams need a proactive, automated approach to monitoring and securing their cloud management plane. Join us for this informative webinar on how to achieve security compliance for public cloud Infrastructure-as-a-Service (IaaS) platforms such as AWS and Microsoft Azure. Advanced phishing attacks and ransomware continue to plague organizations worldwide. Email continues to be the number one vector for malware, including ransomware, and users continue to be easily social engineered into opening phishing emails. What are organizations doing to prevent phishing attachs that can steal confidential data, including credentials? Combating these threats requires a powerful combination of advanced protection and user security awareness. Join this webinar to learn about email threat isolation, a paradigm shift in the fight against phishing attacks and ransomware. - Isolate malicious threats in links and attachments to prevent malware payloads and credential theft. In addition, see Symantec Email Threat Isolation in action, with a demo that showcases safe rendering of links. Cyber security professionals are at a crossroads. The game has changed, and the bad guys are getting more aggressive and inflicting more and more damage on corporate assets—and reputations—worldwide. Ransomware is through the roof, zero-day exploits are exploding, threats are hiding in encrypted traffic and email is riddled with malware. There is no perimeter anymore. Data, devices and employees are mobilized and traffic is increasingly going to the internet and cloud applications. So, the question now is, how do you protect a castle—by which we mean your enterprise—when the walls are tumbling down? Organizations are using more cloud services for more business-critical activities. At the same time organizations face growing privacy regulations, a high rate of data loss (accidental exposures and breaches), and ever-increasing attacks on their cloud assets. It is challenging to get the visibility and security you need to protect your Software as a Service (SaaS), Platform as a Service (PaaS), and Infrastructure as a Service (IaaS) clouds as cloud security offerings have been both limited in scope and fragmented across point products. Discover what’s new and the best solutions for the most complete visibility, data security, threat protection and compliance management for your public cloud services with integrated cloud security. - New Integrated Compliance Management for IaaS – the first Cloud Security Posture Management (CSPM) solution integrated with Cloud Access Security Broker (CASB) and Cloud Workload Protection Platform (CWPP) offering detailed compliance remediation. - Fastest Acting Cloud App Security – the first API-based CASB that can remediate security issues in seconds, with new Fast APIs for Microsoft and Box. - Broadest & Deepest Cloud App Coverage – CASB data security and threat protection for any cloud app, including custom apps. Businesses today are learning that migrating to the cloud does not happen over night. It takes time and many businesses face the challenge of having to manage both on-premise and cloud solutions. Discover what’s driving businesses to transition to the cloud, the reality of today’s cloud, and best practices from the frontline. Join Darren Thompson, Vice President and CTO in EMEA, as he walks the audience through “a day in the life of a cloud migration”. The ubiquitous use of mobile devices has radically changed the landscape of data protection and the abundance of applications only complicates the situation. How, then, can mobile device data be protected? This webcast reviews the current and emerging services and practices designed to help secure and protect the data on these devices, and identifies areas where solutions are needed to fill the remaining gaps and provides recommendations for a holistic approach including mobile threat protection. Traditional perimeters vanish as organizations move to the cloud and employees work in a world of both sanctioned and unsanctioned applications. Companies must rethink their approach to securing data in this new environment. There is a natural tension between decentralized, distributed DevOps and the traditional command-and-control approach of classic security management. When moving to the cloud, organizations must learn how to decentralize and democratize the security process. Join Raj Patel, Vice President Cloud Platform Engineering, Symantec and Sameer Vasanthapuram, Partner Solutions Architect, AWS to learn how to automate security into the DevOps toolchain and strike a balance between agility and security in the cloud. Symantec threat researcher Stephen Doherty joins us to discuss our recently published research into a wave of attacks against financial institutions in West Africa. We also discuss some new research that found that many free mobile VPNs could actually compromise people’s privacy, a hitman who was convicted thanks to evidence found on his smartwatch, and an embarrassing compromise of the ATLAS MMO game. Also this week, Russia is back in the headlines again, with the DNC revealing it was targeted once again by a spear-phishing campaign originating in Russia in November last, while Facebook also removed a number of “inauthentic” accounts that it says were based in Russia and involved in spreading misinformation on the social media platform. Symantec protects information wherever it’s stored or accessed. from your company’s most important information to your family photos.Everything we do begins with what we’ve learned about keeping people’s information secure. We operate a worldwide cyberintelligence threat network that positions us to proactively address where you’re most vulnerable. This network captures worldwide security intelligence data that gives Symantec analysts unparalleled sources of data to identify and analyse, to deliver protection and provide informed commentary on emerging trends in attacks, malicious code activity, phishing and spam.